Merrimack Pharmaceuticals says it will eliminate approximately 60% of its staff, explore strategic alternatives, and halt development of its lead candidate MM-121 (seribantumab), in a restructuring coming nearly three weeks after the monoclonal antibody failed a Phase II trial in patients with non-small cell lung cancer (NSCLC). The 60% workforce reduction—to include all open positions—will begin immediately and be completed by February 2019, Merrimack said. Merrimack’s job cutting would eliminate 43 positions, based on the 72 full-time employees the company reported as of January 31, according to its Form 10-K annual report for 2017, filed March 12. Of the 72 employees, 48 were engaged in R&D, Merrimack disclosed in the filing. The company is estimating that it will incur between $1.5 million and $1.75 million in one-time restructuring charges for the layoffs. “We want to make sure that we keep everything open and we want to make sure that the process plays itself out,” Merrimack CEO Richard Peters, M.D., Ph.D., told analysts yesterday on the company’s conference call to discuss third-quarter results, according to a transcript published by Seeking Alpha. Merrimack also said it will halt development of all ongoing clinical programs for MM-121—including the Phase II SHERBOC trial (NCT03241810), designed to assess the candidate in combination with fulvestrant, versus placebo and fulvestrant, in patients with heregulin positive, hormone receptor-positive, and ErbB2 (HER2) negative, post-menopausal metastatic breast cancer. SHERBOC’s primary endpoint was progression-free survival (PFS), with objective response rate, time to progression, and overall survival as key secondary endpoints. In February, SHERBOC began enrollment of patients who had progressed after one or two lines of prior systemic therapies for metastatic or locally advanced disease and have received prior CDK inhibitor-based therapy. 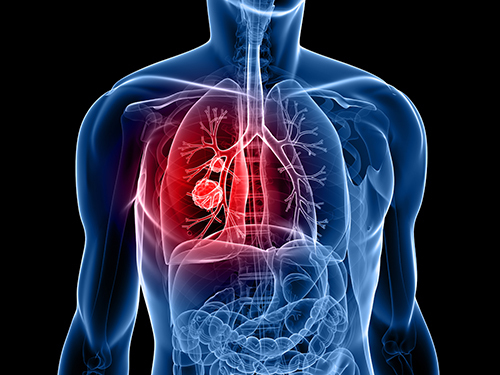 On October 19, Merrimack acknowledged that MM-121 missed its primary endpoint in the Phase II SHERLOC trial (NCT02387216) by failing to improve progression-free survival (PFS) after being added to docetaxel in patients with heregulin positive NSCLC. That failure touched off a company review of its entire pipeline since it was Merrimack’s second since June, when the company ceased development of its pancreatic cancer candidate MM-141 (istiratumab) following its failure in a Phase II trial. MM-121 is a fully human anti-HER3 (ErbB3) monoclonal antibody designed to target phenotypically distinct heregulin positive cancers within solid tumors by blocking the HER3 pathway by preventing the signal between heregulin and the HER3 receptor. MM-121 received the FDA’s orphan drug designation in November 2017 for the treatment of heregulin positive NSCLC. Following the pipeline review, Dr. Peters said, Merrimack is focused on its clinical development program for MM-310, an antibody-directed nanotherapeutic targeting the EphA2 receptor and indicated for solid tumors, and will narrow its preclinical development efforts to focus on two promising candidates, MM-201 and MM-401. MM-310 is currently being evaluated in a Phase I trial (NCT03076372) in patients with solid tumors. After treating the first 14 patients in the first dose-escalating regimen, early data showed signs of “encouraging” antitumor activity in four patients, including two NSCLC, one soft tissue sarcoma patient, and one ovarian cancer patient who additionally had a 70% reduction of CA-125, an associated tumor marker. However, emerging cumulative grade 3 peripheral neuropathy following multiple cycles of treatment was observed in three patients, Merrimack said. The study has been amended to test an alternative dosing schedule, after pharmacokinetic and preclinical data indicated that lengthening the time between dosing may improve tolerability of MM-310. Patients are now being screened under an every-four-week schedule amendment, and will be dosed starting at the highest dose level reached in the prior regimen. Merrimack plans to provide an additional safety update from the study in Q1 2019. MM-201 is a highly stabilized agonist-Fc fusion protein targeting death receptors 4 and 5. MM-401—a previously undisclosed immuno-oncology program—is an agonistic antibody targeting a novel immuno-oncology target, TNFR2. Merrimack plans to disclose MM-401 data at the 30th EORTC-NCI-AACR Symposium on November 14, in a poster presentation, “Targeting TNFR2—A Key Regulator of the Tumor Immunosuppressive Microenvironment.” The presentation will highlight “robust” responses to MM-401 as a monotherapy in multiple mouse tumor models, including in PD-1 antibody-resistant tumors, as well as in combination with checkpoint inhibition, the company said. Dr. Peters said the restructuring will allow Merrimack to extend its cash runway from the first quarter of 2020 into at least the second half of 2022. The company’s cash and cash equivalents shrunk by 47% over nine months, to $49.794 million as of September 30, from $93.441 million as of December 31, 2017. In its cash runway calculation, Merrimack included not only the cash and cash equivalents, but $35.052 million in marketable securities, and a $5 million milestone payment the company received in October from Shire tied to achieving the sale of the marketed anticancer drug Onivyde® (irinotecan liposome injection) in its first “major” non-European, non-Asian country. The $5 million is part of the $33 million in milestone payments which Merrimack is eligible to receive from Shire as part of Merrimack’s up-to-$1.025 billion sell-off of Onivyde and global oncology assets to Ipsen last year. Under that deal, Ipsen took over an existing licensing agreement with Shire, which gave the latter ex-U.S. commercialization rights to Onivyde. Also under that deal, Merrimack is eligible for up to $450 million in regulatory-based milestones payments from Ipsen, and up to $5 million in milestone payments triggered by Ipsen and Servier advancing their ongoing multi-part clinical trial of Onivyde in small-cell lung cancer into the randomized part of the study focused on efficacy. Merrimack has excluded the $5 million milestone from its cash runway guidance until it is achieved.